Anthills are created as a by-product of worker ants digging subterranean tunnels. In fact, ants in general move more earth (soil) than any other organism, including earthworms. As the worker ants dig out the colony's tunnels, they dispose of the displaced earth by carrying it back out of the colony and depositing it near the entrance. They also dispose of any garbage found in the colony in this way. They carry these tiny bits of dirt and garbage in their mandibles. Usually, this combination of materials is dropped off at the top of the anthill, so it does not slide back down the hole into the colony, although some species of ants work to cultivate a specific shape to their anthills. What Are Anthills Made Of? Anthills are simply piles of fine soil, sand or clay, sometimes with pine needles. They do not usually have any kind of rocks or pebbles in them, as these items are too heavy for a worker ant to carry. Some species of ants use tiny sticks, which they mix with dirt or sand, creating a strong mound that offers protection from the weather. Oftentimes the soil contains seeds, which sprout and grow on top of the anthill, effectively disguising its shape and appearance. All ant hills are interlaced with many chambers which are connected by tunnels. These small rooms are used for nurseries, storing food, and even as resting places for the worker ants. During the day, the worker ants move the larvae up to the rooms nearer the top of the anthill, to keep them warmer. At night, they move them back to the lower chambers of the nest. The design of these anthills varies depending on the species of ant. 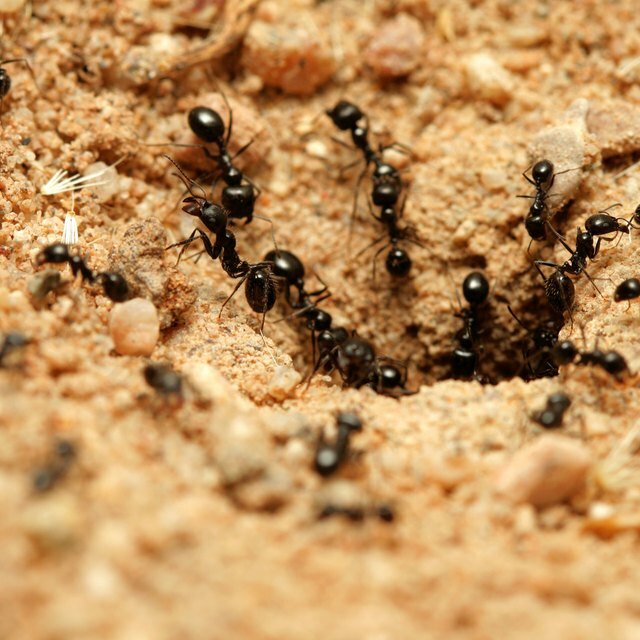 Some ants create soft, low hills out of dirt or sand. Others create towering creations of clay. Western Harvester ants are unique in that they create a somewhat smaller mound on top, but underneath lies a tunnel that can go straight down for up to 15 feet. Single anthills can range between less than an inch high to over 10 feet high. Allegheny Mound Ants build mounds at the rate of about 1 foot per year. Connected anthills with cooperating colonies have been discovered to stretch over 13 miles in Japan, and a colony was found to cover 3,600 miles in Europe. The colony in Europe stretches from the Italian Riviera to the northwest corner of Spain. The ants are Argentine ants, and there are billions of them, living in millions of cooperating nests. Sanders, April. "How Does an Ant Build Its Hill?" Sciencing, https://sciencing.com/ant-build-its-hill-4587980.html. 13 March 2018.